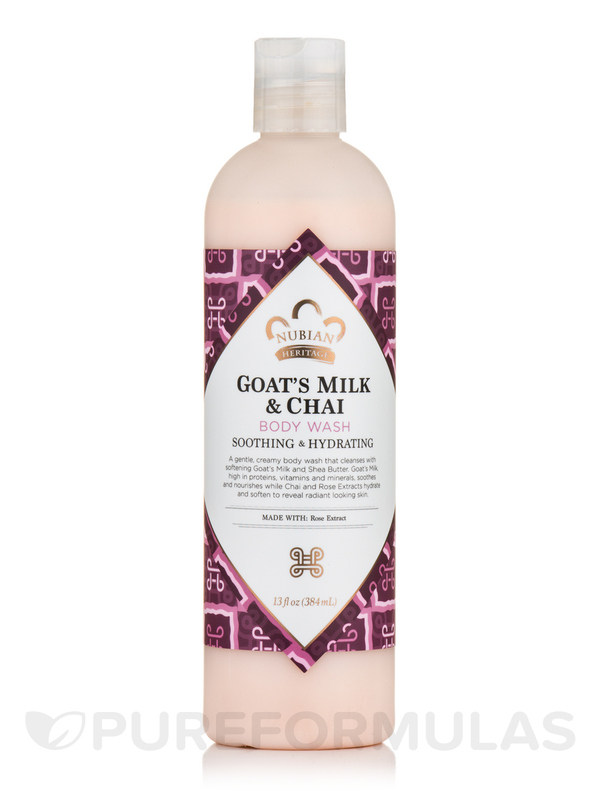 Goats Milk & Chai Body Wash by Nubian Heritage smells luxury, cleans well and very hydrating! Goats Milk & Chai Body Wash by Nubian Heritage smells really nice and makes my skin soft. A little goes a long way. Goats Milk & Chai Body Wash by Nubian Heritage is so addictive with luxury foam and scent, and very beneficial for skin. A gentle‚ creamy body wash that cleanses with softening Goat's Milk and Organic Shea Butter. Goat’s Milk‚ high in proteins‚ vitamins and minerals soothes and nourishes. Chai and Rose Extracts hydrate and soften to reveal radiant looking skin. Images of roses have been found on the walls of Egyptian and Abyssinian tombs dating back to 500 BC. Cleopatra's rose and milk baths illustrate a well documented history as luxurious skincare additives. Chai‚ the word for tea in Swahili‚ is integral to the cultural and social fabric of many civilizations. Chai‚ rich in antioxidants‚ help defend against free radicals and help nourish the skin to maintain a more youthful looking appearance. Cocamidopropyl Betaine (Coconut Oil Soap)‚ Ammonium Lauryl Sulfate (Palm Kernel Soap)‚ Sodium Lauroyl Lactylate (Palm Kernel)‚ Glycol Stearate (Palm Kernel)‚ Stearamide AMP (Palm Kernel)‚ Deionized Water‚ Butyrospermum Parkii (Shea Butter)*‚ Goat's Milk‚ Essential Oil Blend‚ Panthenol (Vitamin B-5)‚ Sodium Lauroyl Hydrolyzed Silk (Silk Proteins)‚ Cocos Nucifera (Coconut) Oil‚ Guar Hydroxypropyltrimonium Chloride‚ Rose Extract‚ Green Tea (Chai) Extract‚ Lonicera Caprifolium (Honeysuckle) Flower (and) Lonicera Japonica (Japanese Honeysuckle) Flower Extract. Cruelty-Free / No Animal Tested / Certified Organic Ingredients / Made in the USA. Apply to washcloth or hands. Cleanse entire body. Daily use will result in softer‚ healthier looking skin. If irritation occurs‚ discontinue use. Notice: Natural ingredients may vary in color and consistency. I love this soap, it makes my skin really, really soft (a softness that stays and doesn't dry out immediately), and it smells amazing! 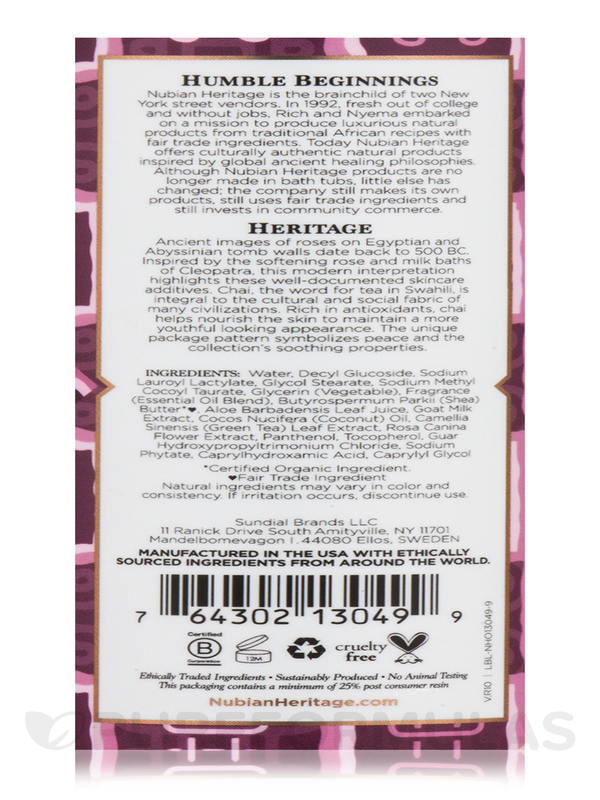 Love everything about Goats Milk & Chai Body Wash by Nubian Heritage: thick, creamy, a little goes a long way. Subtle scent, leaves skin smooth and soothe itchiness. I just love this Goats Milk & Chai Body Wash by Nubian Heritage. It lathers and has a refreshing smell. Leaves skin silky smooth. Goats Milk & Chai Body Wash by Nubian Heritage has a nice smell and leaves the skin soft. Goats Milk & Chai Body Wash by Nubian Heritage gives you 100% aromatherapy results. My spouse absolutely loves the feel, scent and relaxing results he experiences during the shower. The scent lasts for numerous hours. The lotion is also a 100% sweet bonus. Buy both products today! Everything! It has great lather and a awesome scent. I have used Goats Milk & Chai Body Wash by Nubian Heritage for weeks now and it is very moisturizing. I have sensitive and dry skin. This product doesn't irritate my skin and helps to moisturizing without stripping my skin of its natural oils. I will reorder and purchase the matching body lotion too. Moisturizing and pleasant feminine scent. A little really goes a long way. Goats Milk & Chai Body Wash by Nubian Heritage feels great & I love the way to smells. Really great body wash!